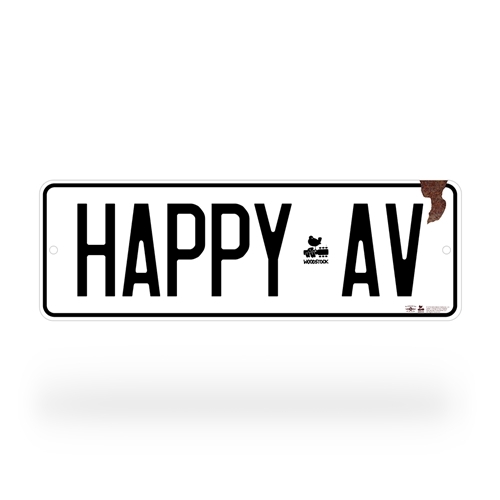 The official Woodstock "Happy Ave" Street Sign is now available through Bluescentric. 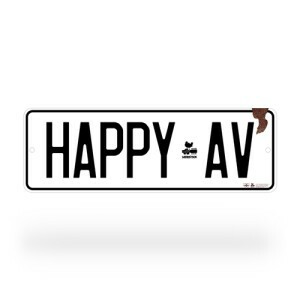 The sign is just like the original Happy Ave in 1969. The 1969 Woodstock Music and Art Fair promised "An Aquarian Exposition in White Lake, N.Y." What it delivered was an experience that changed the course of American culture, and lead to an explosion of Peace & Music. The Woodstock sign is full-color on .026 aluminum, and measures 18 inches by 6 inches (147 x 153 mm), with 3/4 inch rounded corners and two 1-3/8" drill holes for hanging. This hippie-styled music sign is great for fans of the 1960s, the hippie counterculture, musicians, and Woodstock fans. Works for indoor or outdoor use, and will last years. For maximum life, try to keep away from continuous, direct sunlight.